First the Boogie Room gets evicted. Then the Orchard Spotlight goes dim. And now, Daredevils & Queens gets the axe. What the hell’s going on here? 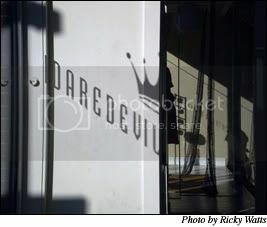 At around noon yesterday, Travis Kennedy, owner of Daredevils & Queens, was paid a visit by the Santa Rosa Fire Department and given a stern verbal warning to not host any more gatherings there. No written notice was issued, nor any specific citations made pertaining to emergency exits or capacity—just a heads up that one of their marshals had walked by the other night and noticed a group of people inside. Kennedy had hosted a private birthday party for a friend, with about 50 guests, the week before. Any such afterhours assemblies at Daredevils & Queens, Kennedy was firmly instructed, are against city zoning code. This, of course, is terrible, terrible news. The successful hair salon that’s also hosted numerous art shows, reunion events and musical performances has grown into an increasingly vibrant and important center on Railroad Square’s cultural map. Every single event I’ve attended there has been well-mannered and safely monitored. Especially because the city has placed such an emphasis on supporting the arts, Kennedy is understandably dismayed that he’s in a position to cancel all his upcoming events—including a May 2 show with Polar Bears, Shuteye Unison and Prizehog. Kennedy has held events very sporadically—once every two months or so—and has never received any complaints from neighbors or police. He’s never taken a percentage of art sales, and in fact he always, always spends his own money to buy merchandise and support the artists and musicians he willfully opens his salon doors to. Is it really such a crime to broaden your place of business to support the local arts and music community? Kennedy is looking into finding out how he can work with the city and continue to host events at Daredevils & Queens legitimately, but for now, all events are off. It seems that the time to make a stink is arriving forthwith, if not already passed! It seems to me that he is in his rights to hold events. This is the same location as Cafe This and CT did evening events all the time. Were they in violation? Is it a matter of needing more sprinklers or marked exits or is it just cranky neighbors? This is just so frustrating. That’s FBG if you ask me! This is frustrating. Santa Rosa as so few interesting venues as it is…in the past few months they’ve systemically shut down the few available. What can be done? We can’t just give up! Hmmm, maybe fire marshall Bill should’ve shut down my mother’s 85th birthday party tonight (at a store that shall remain nameless). We had an unlicensed dog there too.